This is a darker and somewhat sweeter fruit than the loganberry, – fj’ifcfcfr arsenate ami nQt distinguishable is not from the phenomenal berry. Its culture is as explained under Loganberry. 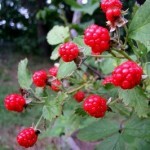 The newberry does not produce such a large crop as the loganberry, though its growth is similar.